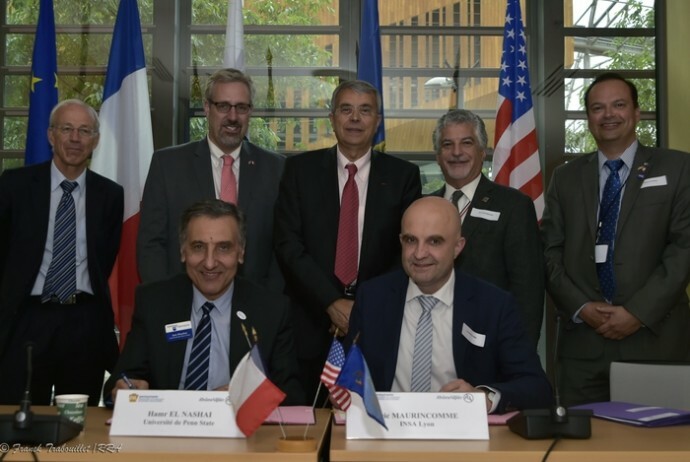 The National Institute of the Applied Sciences (INSA) in Lyon and Penn State University have signed an partnership agreement which organizes student, researchers and expert exchanges as well as development of common programs leading to qualifications. Both plan on leading joint research and formation projects, and to participate in scientific events. The partnership was signed in the presence of Jean-Jacques Queyranne, President of the Rhône-Alpes region (former minister), Clayton Stanger, Consul General of the United States in Lyon, Wilfred Muskens, Under-Secretary for International Development, State of Pennsylvania, Pr. Amr Elnashai, Dean of Penn-State Engineering, and Eric Maurincomme, Director of INSA Lyon. For this occasion, numerous events about economy, culture, tourism, higher education and research, combining “Rhônalpins” actors and the american community installed in the region, were organised. Since 2006, Rhône-Alpes and Pennsylvania are engaged in a unique cooperation, the Region being in fact the only one in France, to be partners of an american federated state. These links lead to a closer relations in the economic, research, tourism and culture domains and will allow Pennsylvania to participate in the world-wide summit on climate and territories on the 1st and 2nd of July in the Regional Council..